As a multimedia designer, Kaaren Poole is an inspiration to designer-artists who want to use their jewelry-making passion to help charities close to their hearts. Through her creative endeavors, Kaaren supports animal rescue programs and founded her own non-profit organization, Wild Hare Art for Animals. Kaaren's goal is to be competent in several media, so when designing, she can choose the medium that best fits her design concept. She works in graphite, colored pencil and acrylics, and in 2005, she and her daughter learned to bead and bead appliqué. 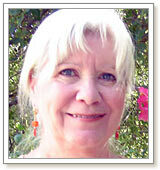 As an active member of the arts community, along with her charitable efforts, Kaaren leads a busy ''retired'' life. She is a member of and recording secretary for the International Polymer Clay Association (IPCA), formerly National Polymer Clay Guild. She is active with the local art group, the Placerville Arts Association, serving as the membership chairman and member show chairman. Kaaren also volunteers with the Sierra Wildlife Rescue, in addition to managing and designing for her non-profit organization. 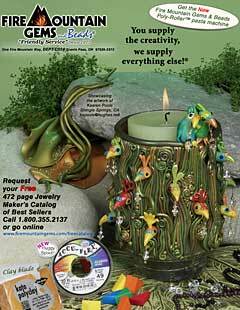 As seen on the back cover of Polymer Café magazine, April 2009, Parrot Paradise, was the feature for the Fire Mountain Gems and Beads advertisement. 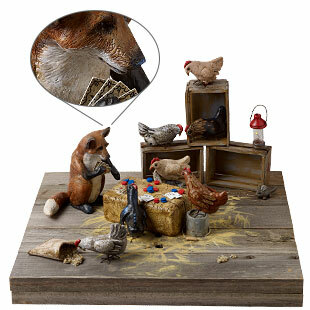 Kaaren was awarded the silver medal in the Kato Polyclay™ category of the 2008 Fire Mountain Gems and Beads Beading Contest for this striking home décor piece. Just like her other polymer clay designs, Parrot Paradise is the result of letting the clay be her guide. ''One day, while shopping in Michaels, I saw glass votives and thought it would be fun covering them with translucent clay and seeing if the candlelight would show through. About the same time, I was toying with a design for a necklace centerpiece built around images inspired by photographs of parrots nesting in crevices on a rocky cliff. Then the two concepts came together--votive, yes, translucent clay, no; parrots nesting, yes, necklace, no. So, a votive covered with nesting parrots! ''Once I had the concept, it was just a matter of doing it. I covered the votive with a thin sheet of clay, modeled the parrot heads and stuck them on randomly, then worked the vines and leaves around them. I liked the uneven bottom edge that emerged, so I cut away the base layer of clay. There were gaps in some places that were tricky to cover, so I cut away the base layer for little ''windows.'' It seemed to need something more, and the parrots said, how about a parrot pair for the rim? Kaaren was awarded many other honors in the polymer clay community in 2008. She was a finalist in Amaco's Bottles of Hope competition for Hope on a Rope (necklace), Bead and Button Bead Dreams competition for MacGregor's Garden (necklace) and the National Polymer Clay Guild's ''Progress and Possibilities'' competition for Feline Ceremonial Collar and Headdress (wall art). In 2009, Kaaren entered two pieces in the Fire Mountain Gems and Beads Beading Contest--Easter Egg Ornament and Goldfish Glory - in the Kato Polyclay™ category. Starting a non-profit organization took time. The legal process of setting up a corporation and obtaining non-profit status from the state and the IRS consumed nearly a year of Kaaren's life. ''First, I had to establish a corporation here in the state of California and apply for an EIN (Employer Identification Number) from the IRS. Once the corporation existed as a legal entity, I could apply for non-profit status with the state of California and the IRS--and arduous and lengthy process. During that time in 2008, I focused on building my status as an artist. ''I selected the organizations that Wild Hare would support from my own personal experience. Agee Memorial is a local cat shelter started and run by a dear friend. I have worked as a volunteer with Sierra Wildlife Rescue and have admired the dedication of so many volunteers to the welfare of the wild members of our animal family. Idaho Bear Rehab is an organization I found on the web while researching bears and I am impressed by how well they benefit the bears--one of my favorite animals. ''Once my non-profit status was approved, I began working more on marketing. My pieces are generally priced too high for crafts fairs, but I am participating in studio art tours and am hoping to be juried into Crocker Art Museum's holiday artisan show. Promoting my website is a major issue. Advertising is expensive and finding the right approach is an art in itself. However, Google® has an advertising grant program for non-profits for which I am applying. I will also be working on my website to make it more visible to search engines. ''For those of you who want to use your jewelry-making passion to help make a difference, donating pieces to fundraisers for causes that are important to you is a great way to use your talents to help make a difference. ''You can support directly by donating pieces to auctions. I recently donated a necklace and earrings set to a fundraiser auction and it sold for over $300--all of which went directly to the charity. ''Or you can support indirectly. Several organizations, notably Susan G. Komen Race for the Cure®, sponsor walks or runs where each participant must raise a certain amount of money to participate. You can help those individual participants in their fundraisers. My daughter did the 60-mile walk for several years and each year had to raise around $2,000. 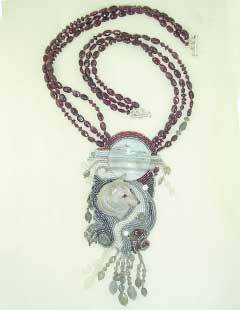 Some years I donated beaded pieces to an auction that her group held. Other years I made small ''thank you'' gifts that she gave to her contributors. Kaaren was awarded Silver Medal Prize Winner in the Kato Polyclay™ category of the 2009 Fire Mountain Gems and Beads Beading Contest for her design, Easter Egg Ornament. View more of Kaaren's art in the Gallery of Designs and visit her website at wildharestudio.org for more information on Wild Hare Art for Animals.